The community of waste pickers in Calcutta stands on its own against the hostile outside which comprises the state, elites and mainstream society. The residents of this unique world continuously try to escape the ‘ideal’ world of uniform homogeneity of legally legitimate profession, shelter, sanitation, education, healthcare, savings, credit and cultural activities of the mainstream. This book examines the lives and society of a marginalised urban community of waste pickers living within the city of Calcutta, and yet on the periphery of mainstream society. Through interpretive ethnography of the studied community focusing on ideological marginalisation, as distinct from economic marginalisation, the book studies the community and their world. 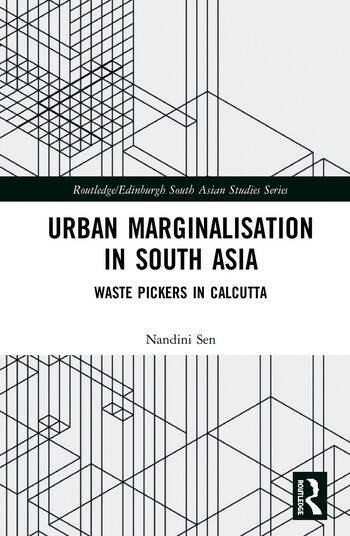 It uniquely presents a volume of work in the field of ideological or socio-cultural marginalisation: showing how and why socio-cultural marginalisation is expressed through the daily experiences of material and emotional dilapidation, and physical and socio-cultural seclusion as experienced by the waste picking community in Calcutta. It provides an extensive and intimate discourse on the decay of the soul and mind, breakdown of the interpersonal and neighbourhood ties through the mediation of the biased state, mainstream and elite policies attached with the defamed peripheral regions of the city. It argues that ideological marginalisation represents alternative resistance to exploitation through silent defiance, non-participation and non-cooperation by the marginalised people with mainstream society, state and non-governmental organisations (NGOs). It concludes that there is a large scope for studying the negotiation skills of waste pickers/marginalised people in terms of their business with their retailers which help them attain some economic returns, although they still lack social capital, networking skills and human capital. Presenting exciting new ethnography against the background of important theoretical concepts, the book initiates a dialogue about options for a change in the situation of these marginalised people vis-à-vis the state, elites and mainstream society. It will be of interest to an interdisciplinary audience in the fields of Social and Cultural Anthropology, Urban Studies, Development Studies, Urban Sociology and South Asian Studies. Nandini Sen received her PhD from Goethe University, Frankfurt/Main, Germany.